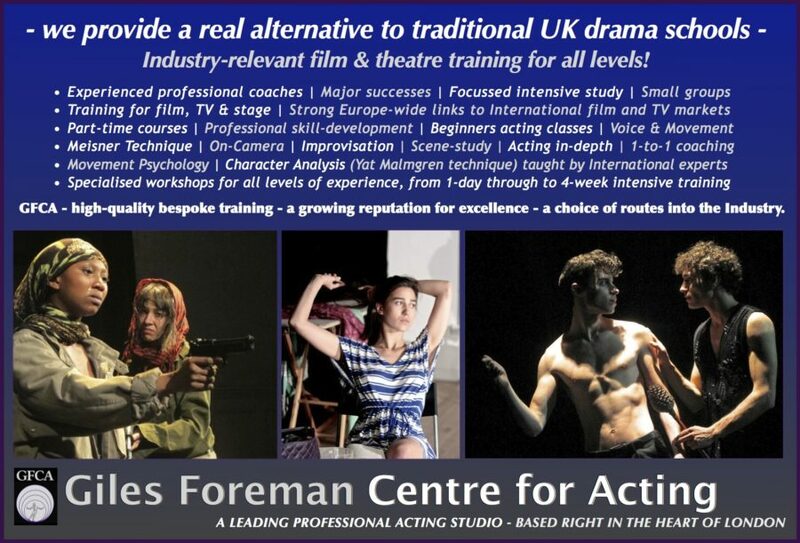 The Giles Foreman Centre for Acting offers fresh opportunities for people to start or continue to develop their acting skills, in a supportive yet exciting environment! This is an exciting 10-session course for those relatively new to acting. Members of GFCA’s ensemble of teachers take people on a fun-packed journey into the art of acting. Here you can learn exactly what acting is from many perspectives. You are introduced to the technical skills of voice and movement, expand your imaginative powers, learn how to use yourself and your experiences in your acting, how to breathe life into characters, how to break down a script and much more! Who knows, by the end of the course you may well decide to explore acting on a deeper level in regular acting classes at GFCA. Even if not, you will be able to apply many of these skills in other walks of life, and hopefully, will feel far more confident in your ability to communicate in public. GFCA is one of the best institutions for studying acting in London and the technique taught is drawn from the work of the great acting teachers of the world from Stanislavski himself through to Lee Strasberg, Uta Hagen, Sanford Meisner and Stella Adler. We offer a small group-size and a structured programme to encourage thorough progress and exploration. The course is less expensive yet more focussed than many of the other courses out there – excellent value for money, with our experienced acting coaches. No interview is required before starting, but book early as places fill fast. A 10-session course, offered 3 times a year. “It was such an inspirational class. I am really looking forward to the next one” – participant in the January 2015 course. This course runs from the end of September until July, in 3 terms, building up experience and breadth in acting, in a sustained approach that is not achievable on a short Introductory course alone. It takes you from entry-level onward; you will learn acting in depth, both theory and practice, and challenge yourself as part of a small group, in a focussed and progressively-intensifying process of exploration. It is ideal if you are preparing to apply for higher-level intensive study. INTRODUCTORY Classes such as Introduction to Acting for Beginners / ENTRY-LEVEL and ACTING:30-WEEK PROGRESSION (described above) are open to anyone interested in finding out more about acting, and entrance is open. Here participants embark on the journey that is to discover real acting theory, technique and practice. They begin to learn to use oneself and one’s own resources to ‘leave oneself alone’, to be open, private in public and able to follow an impulse. They begin to understand the concept of super and scenic objectives, text analysis, and a methodology for building a character. All of this occurs through a series of exercises and scene rehearsal. After working on the fundamentals in these Acting classes, individuals who have shown real progress and aptitude are invited into the INTERMEDIATE class. INTERMEDIATE class is altogether more demanding and rigorous; with new, more advanced exercises and classical scene-work introduced. People are encouraged to join the technical classes of voice and movement – which are imperative if one wishes to truly access one’s potential to be a professional actor. This course is designed for all actors with some training, to push themselves further into their craft. In a series of intensive, enjoyable sessions, students explore the world of one of the great plays of the 20th century working in the great traditions of actor training. They are taught to enrich the emotional inner life of their characters through a range of challenging and liberating exercises culminating in scene work on the text from the play. The work also focuses on the outward manifestation of this inner work/outer life – including physical life and vocal work. Classes are structured to the individual needs of each person, to unlock authenticity and truthfulness and explore the infinite possibilities within us all. A rolling programme, bookable in blocks of 12 weekly sessions, offered throughout the year. Those who progress in this class may be invited to join the ADVANCED CLASSES AND WORKSHOPS – the point at which participants might consider committing to acting in a fuller and more comprehensive way – or to audition for our FULL-TIME ADVANCED PROFESSIONAL INTENSIVE TRAINING. Actors at this level are eligible to take part in the Centre’s productions and workshops, and they are encouraged to develop pieces for our performance evenings. They may be involved in showcases, roles in productions and short films. They join a vibrant and evolving ensemble, providing them with a creative home – essential in the notoriously precarious and lonely world of the actor – and continue at the studio, to ensure that they are developing themselves all the time. An actor’s training does not cease the moment he or she leaves Drama School – in fact in many ways it has only just begun. Stanislavski believed that it was impossible to become a truly accomplished actor before the age of 40. It is vitally important that like great athletes or musicians, actors continue to practise and refine their skills and to develop new ones. As we all know acting is a ruthlessly competitive industry – increasingly so. Few of us get the opportunity to work all the time, which was how actors used to develop themselves. Nowadays it is important to find a forum where one can practise, tune ones skills and essentially stay competitive while feeling creative and hopefully inspired. GFCA aims to supply high-level classes in various disciplines at very reasonable prices. It is also at the heart of a community of actors, writers and directors; many projects and working partnerships arise out of these sessions.